"I am 13, and do a lot of singing. My jaw always pops in and out of place when I'm singing recently, and my voice is getting really tired. Is my jaw the cause of my voice feeling tired?" Find an empty wall; put your head and heel flush against it. You should notice that your ribs are open wide in this position. Put your open hand about an inch from your mouth. Sing to your hand, while trying to leave as little breath on your hand as possible. This should cause you to back off the "air force" you normally think you have to use. When you take the pressure off your voice, your jaw often just finds it's own comfortable flexibility and the popping will diminish. Let me know how it works for you. ps... hope you all had a great Thanksgiving, with your jaws working on delicious fare! Indie Connect is proud to present: "12 Choices to Solid Song Craft, An Interactive Workshop", conducted by Grammy Nominated, BMI-award winning tune-smith, Rand Bishop. Bishop has well over 200 cuts to his credit in a wide range of genres, "from bluegrass to heavy metal," including the 5-week #1, My List, recorded by Toby Keith, country radio's most-played song of 2002. Bishop is the author of the hit songwriting memoir, Makin' Stuff Up, secrets of song-craft and survival in the music-biz. The workshop will begin with Bishop filling attendees in on the 12 most essential choices to constructing a solidly crafted pop song. Attendees will then break up into co-writing teams to collaborate on these 12 choices. Bishop will circulate, coaching each team, and guiding them through their process. Finally the group will come together to discuss and evaluate each team's choices and brainstorm suggestions on how to improve them. Registration: $40 (lunch not included). Indie Connect Members save $5.00! Note: The 1st 10 registrants will be eligible for a drawing for a free 30-minute consultation by Rand! if you haven't eaten enough. You need to eat an easy-to-digest but nutrient-packed meal or snack, or you will not have the breath support or energy you need for performance. if you eat early enough so that the food has shifted lower in your system and will not tend to make you feel stuffed, interfering with breathing. if you note in your own personal experience how eating before singing affects you, and you are confident it won't be a problem. if you eat too much or eat things that are hard to digest, diverting energy to your belly instead of your singing. if eating makes you sleepy. Again, this has a lot to do with what you've chosen to eat. if you tend to hunch over after eating because you have eaten too much. This will affect your breath. if you eat foods that bring on acid reflux, or mucous. What are your experiences with eating before singing? I find it's a very individual thing, but also very important to know. It wants mood lighting, OK? Twilight dimmed to pitch black - experiment to find the lighting that makes it the least shy. Sometimes a singer is not bothered, but if there are windows to the daylight, the voice may like you to cover them with something. What the nose doesn't like, the voice won't either. It can affect breath, throat and focus. Save the incense candles for the smokers who sing. They are usually more used to the effect! One must be careful with perfume or room deodorizers, too. The plainer and cleaner the smell in the booth, the better. The voice doesn't like to be stared at. You can fake it out by not aiming your singer (yourself if you're the singer) eyeball to eyeball with the producer, engineer or anyone else. If at all possible, position the mic so that the singer is facing a corner or side of the room... not the control room window. Try and get the temperature in the booth comfortable for the individual singer. It amazes me how many engineers don't understand the importance of this. Ever tried singing when you're shivering? It messes with your control big time. Ever tried singing while burning up? It saps your energy like a vampire, and the voice will sound tired, uncontrolled, numb. If the studio vents are not optimally placed, the people in the control room may need to suffer a bit to get it right for the vocal booth. Yep. The singer comes first. It's great if the "more me" cue box is on a stand instead of at the feet, so micro-adjustments can be quickly made from time to time. If, as I recommend, the singer is wearing headphones with one side half-off the ear, the headphone box should be set on "mono" instead of "stereo". Anybody care to chime in on their thoughts for the perfect vocal booth area? What have I left out? Have you ever had a strange, unexpected attack of stage fright you couldn't understand? There are two prime causes for uncharacteristic stage fright, numbness or nervousness sucker-punching a performer. What you can do: Know that there will be a tightening of your body for the first part of the first song you sing. So, make sure your first song will be easy for you to do... not one of your most vocally challenging. Then, start to sing without fear, because you know what is going on and that the "clench" will pass if you don't hold on to it. Just allow your ribcage, throat and auto nervous system to relax... and they will. Note that size does not matter here. If you are used to playing arenas, a small venue like a 100 seat listening room may feel oddly petrifying. The cure for this ambush: play more of these venues til your 'inner horse' learns to trust them! How? Practice, practice, practice. You should know the lyrics so well you could recite them in your sleep. You should be able to know the song so well in your fingers (if you play an instrument) that your fingers are on "automatic". Have vocal cords at peak operation. There is no substitute for doing the things that put your voice on it's best footing. If your voice is smoothly running, it will smoothly run. If it's rough, it will get rougher because you will try to push it through. So... make sure you are rested, hydrated, peaceful, and exercised... both physically and vocally. 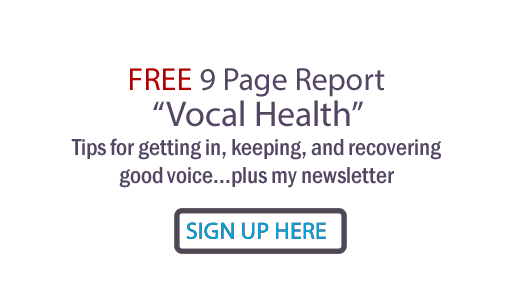 WARM UP YOUR VOICE! Think your little gig is too small to worry about? Think again. The cure for this ambush: Maximize your vocal stamina with Power, Path & Performance lessons and training Cd's .